Rats show empathic helping: Replicated and extended! – The brain is sooooo cool! Rats show empathic helping: Replicated and extended! Nobuya Sato at the Kyoto Train Station in the summer of 2014. I originally learned of Dr Sato’s work on my visit to Japan. I was excited then and even more so now. I am thrilled to say that after roughly 3 ½ years, our work on empathic helping has been replicated by Nobuya Sato and his colleagues. Not only did Dr Sato confirm that rats help other rats in distress but he extended this finding in several ways. 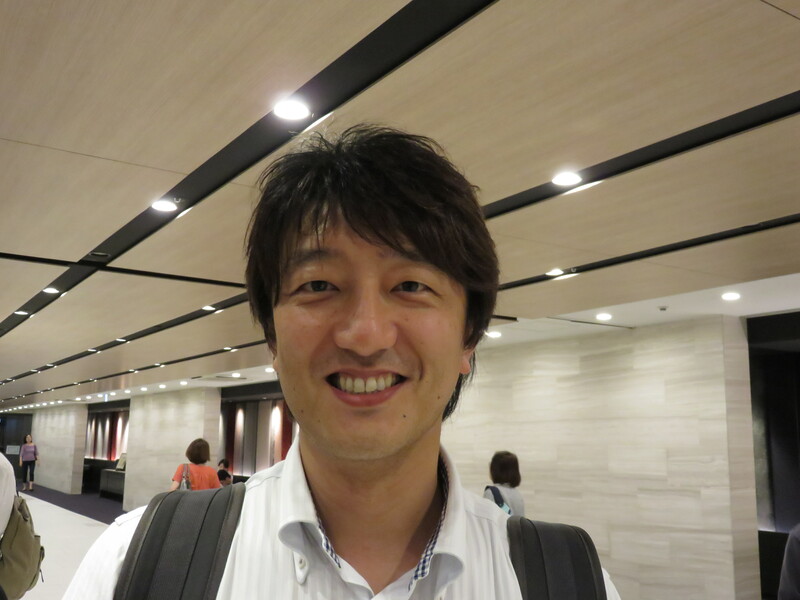 Dr Sato and his colleagues published an article entitled “Rats demonstrate helping behavior toward a soaked conspecific” in the scientific journal Animal Cognition. The basic paradigm that they used was to place one rat in a pool next to an arena with a potential helper rat. The “soaked” rat in the pool could only access the dry area if the other rat opened a circular door separating the two chambers. If the helper rat opened the door, the soaked rat could climb onto a dry floor. The full article by Dr Sato and colleagues can be found here. There are also excellent newspaper accounts by Emily Underwood and Penny Sarchet. However I should mention that the rats were soaked as in soaking wet. They were not drowning and were not in danger of drowning!!! What happened? Well, by the eighth day, the door was opened for the soaked rat in nine out of ten (five male, five female) cagemate pairs tested. Moreover, by the final day of testing, help arrived within about 20 seconds on average. Rats took 3-4 times longer to open the door when the pool was empty (water but no rat), dry (no water and no rat), or contained a toy object (no water and no rat but with a toy). Thus, one rat opens the door to help a cagemate reach dry space and does so consistently at a shorter and shorter latency with every passing day. When we were first working on the experiments that we reported in 2011, our first observation was that rats would open the restrainer door for a trapped cagemate but not for an empty restrainer or a restrainer filled with a toy rat from Ikea. These observations convinced us that the rats were not opening the door just for the fun of opening the door but because of the rat within the restrainer. Once we understood that the rats were opening the restrainer door in response to the rat within, we considered the simplest explanation for this behavior, namely a desire to play. In other words, maybe the free rat liberates the trapped rat to gain a playmate. To test this idea, we placed two arenas together and put the restrainer up against the divide so that opening the door would release the trapped rat into the second arena. This approach prevented the helper rat from access to the released rat. They could not play together. We found that when there was a rat in the restrainer, free rats opened the door, even though they could not play with the beneficiary of their action. If we placed an empty restrainer into this setup, the door-opening behavior extinguished. These results demonstrated that rats engage in pro-social behavior even when prevented from immediate social contact. Despite our experiment showing that immediate social contact is not needed to motivate door-opening, the idea that the rats were motivated by social reward persisted. This idea received support from a perplexing study that purported to repeat our experimental design but in fact bore no resemblance to our study. In fact, the authors set up a bizarre and constantly changing set of rules for the rats that I still am not sure that I understand. I am fairly convinced that the rats did not know what was going on. Nonetheless, the authors’ grand conclusion that rats in our study had been motivated by the desire for social contact was the only take-home message that took hold among many scientists. Enter Dr Sato’s experiment. The aspect that I like the best about Dr Sato’s experiment is that he could disambiguate space from distress. If a rat were placed in the pool area but the pool had no water, then what would happen? If the rat were motivated by the desire for social contact, then the rat would open the door between the two spaces. On the other hand, if the rat were motivated by affect, then the rat would not help. Why would the rat help when there’s nothing wrong? What happened? The rats did not open the door. Thus rats only help when they detect distress. Or to put it another way, distress is needed to elicit help. This is a compelling demonstration that rats are motivated by the affect of another rat and tells us that the rat’s action is best described as help rather than as play. In sum, Dr Sato’s work puts another nail in the coffin of the rats-help-just-to-gain-access-to-a-social-pal idea. First, this recent work is the first confirmation of non-reciprocal helping behavior in rats as demonstrated in our 2011 study showing that one rat helps a cagemate in distress. In our study, one rat was trapped in a plastic tube, called a restrainer, that could only be opened by a second rat who roamed free. My colleagues Inbal Ben-Ami Bartal, Jean Decety, and I found that the free rat consistently opened the restrainer door, thereby helping the cagemate out of a distressing situation. Dr Sato’s work supports our finding that rats are motivated to help another in distress. Fundamentally, the finding of pro-social behavior from rodents demonstrates that helping another in distress is biologically rather than culturally based. A second exciting aspect of the new work is that it extends the parameter space of rodent helping. Let me explain what I mean by that. Consider that there are myriad situations in which one individual could help another individual and that these situations vary according to the perceived need, the potential cost of providing help, the relationship between the helper and recipient of help, perceived responsibility and the like. Some combinations of these factors are more likely to engender help than others. For example, a child is far more likely to receive money to get a snack from a parent than is a stranger on the street. In humans, extreme need such as that which occurs after a natural disaster commonly elicits both direct (lifting a fallen beam off) and indirect (donating money to charities providing disaster relief) help from familiars and strangers alike. I have often wondered how extreme a need would have to be before rats would not help. With too much need, the rat could become so overwhelmed and scared by the situation as to be unable to act. In our paradigm, the restrainer is not so tight that the trapped rat cannot turn around within and I have always estimated that the stress involved is on the mild side of moderate. But my hunch is that being in a pool filled with water is on the severe side of moderate. If that hunch is correct, then perhaps Dr Sato’s recent work extends the range of distress that rats react to with pro-social actions. Dr Sato extended the work to show that previous experience in the pool adds urgency to a rat’s helping behavior. After 12 days of rat #1 being placed in the pool and rat #2 having the opportunity to help rat #1, the roles were reversed. 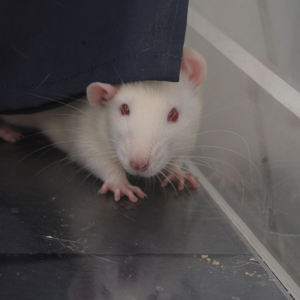 Rat #1, who had been in the pool 12 times, opened the door for rat #2 starting on the second day of testing. Thus, rats with experience in the pool acted on day two in the same way that naive rats acted only after eight days. One possible interpretation of this is that memory of being in the unpleasant pool adds to the rat’s motivation to help. Alternatively, it is possible that the rats discerned how to open the door by watching the original helper do so. It is truly thrilling to see our work replicated. It is also a relief. It has been a long time coming. I think these experiments look easier than they are. They are not difficult technically but working with behaving rats requires quite a bit of rat-think that many modern biologists aren’t well versed in. I hope that many more will help us continue our work on understanding the biology of helping. We’ll all be better off for it. 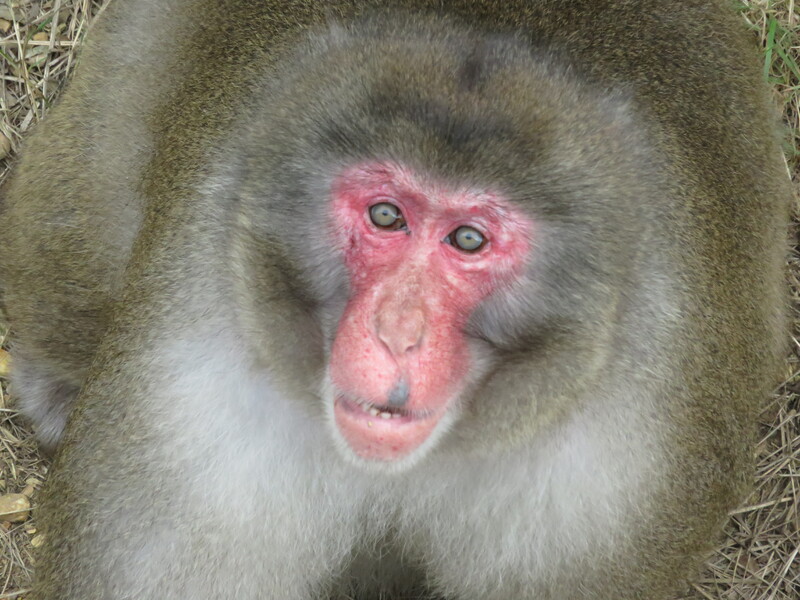 A Japanese macaque at the Primate Research Institute of Kyoto University. Many thanks to Takefumi Kikusui and Hiroki Koda for a marvelous visit. Fascinating about your rats. 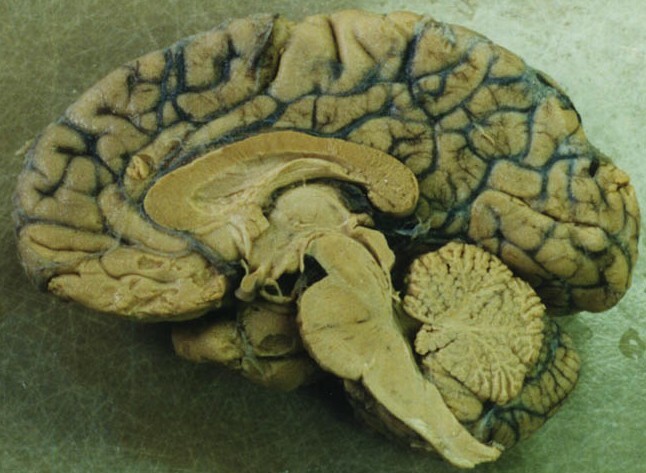 Do we have much more developed frontal lobes than rats? Do you think that maybe rats, with a lot less philosophical queries to worry their minds, remember mother /child helping chemicals more than humans do? Or maybe having less developed brains in some areas makes them nicer people than humans. If you were able to do the same experiment on humans, with the pool as one option, and lots of money as the other option, do you think humans would help the guy in the pool before helping themselves to the money? I am probably very cynical and old, but I think only fools like me would. Mike, you are not the only cynical old fool! Good to know there is another one. That’s great you got confirmation on your studies Dr. Peggy! As much as I love my cats, I can’t see them doing this. Will the rats help if they live in crowded conditions? I look at behavior in terms of how does this help them reproduce. Cats don’t like water but one of my outdoor cats was very distressed and I followed her. Her buddy had her head stuck in the fence. Is their a difference in gender? Do females have more “milk of rat kindness”? 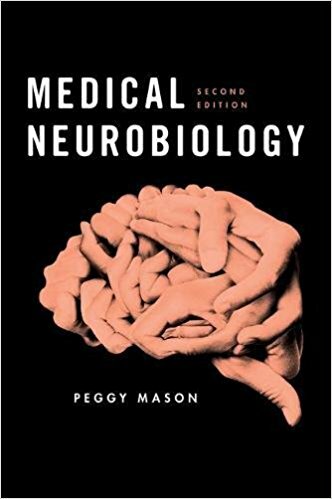 Pingback: It takes two to give – The brain is sooooo cool!